From Japan: Benedict XVI As No One Has Seen Him Before. ROME, August 6, 2015 – More than two years into the reign of Francis, perhaps the most universally acclaimed pope in history, in faraway Japan an important book has been published that presents a portrait not of him but – surprisingly – of his humble and mistreated predecessor. This is what the author read in the handwritten thank-you card that the pope emeritus sent to him through the nunciature of Tokyo. Hajime Konno, “Kyoko Benedikutusu Jurokusei. Kirisutokyoteki Yoroppa no Gyakushu [Benedictus PP. XVI. Renovatio Europae Christianae]”, Tokyo, University of Tokyo Press, 2015. But even more interesting is the second chapter of the summary and the book. There Konno brings to light the universalistic presumption of the contemporary West, which wants to impose its own values on the whole world, excluding non-Western cultures, especially the Asiatic. This leads – as Konno notes – to cultural conflicts not only in the West between progressives and conservatives, but also in the East, as for example in Japan between universalists and nationalists. And the Catholic Church? Konno responds that Christianity was indeed the source of modern values in the West, but in its turn is now in conflict precisely with the anti-Christian consequences and impositions of this modernity. 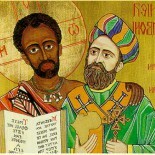 The Catholic Church is therefore like an “East” in the West. And Ratzinger, first as theologian and finally as pope, was a tremendous, lucid protagonist of this global encounter/clash between Church and modernity. IV – SUPERVISOR AT THE COUNCIL, 1945-1966? 1. Germany in 1945. “Modification” or “destruction”? V – PROFESSOR AGAINST THE TIDE, 1966-1977? POSTSCRIPT – From Nicolai-Cathedral (Tokyo) to Altötting (Bavaria). My way to Bavarian Catholicism. Below is the final part of the summary of the book written by the author himself, without the abundant footnotes and bibliographical references found in the complete text. Among the witnesses cited in the volume is also a Japanese, Yasuaki Satono, a former pupil of Ratzinger as theologian and still a member of the “Schülerkreis,” the circle of his ex-students that meets periodically in Rome. Benedict XVI entered the stage of world politics as a Church leader endowed with clear principles and strong will. The name selected as pope, Benedict, indicated his pessimistic diagnosis of the times, or his comparison between the situation today and the late-Roman decadence at the time of Saint Benedict. Already in his homily on the eve of his election to the see, on April 18, 2005, he had clearly taken a position in this regard. The pope’s objective was first of all the defense and reinforcement of the Christian foundations of Europe, even though during his pontificate the curia also dealt intensively with relations with non-European countries, as for example the socialist republics of China and Vietnam. Benedict did not intend to subject himself to fashion and limit himself to governing with diligence. He wanted to decide what should be changed and what not, always on the basis of the Church’s position and independently of the spirit of the times. He was by no means pledged to anti-modernism. He simply intended to preserve the elements that he saw as necessary for the Church, regardless of the fact of whether they were modern or premodern. He eliminated the papal tiara from the pontifical coat of arms, he renounced the title of “patriarch of the West,” he addressed environmental problems with passion. Above all he was, de facto, the pope of the “logos”: with the power of his words, his most powerful weapon, he fought for Christian Europe. 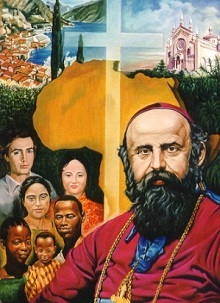 He opened the Church to the most recent means of communication, including YouTube and Twitter, he rehabilitated Latin and the Tridentine Mass, he reached out to the Fraternity of Saint Pius X, he consolidated the liturgy as the solemn actualization of the mysteries, he placed the Eucharist at the center of Christian life, he encouraged the administration of communion on the tongue and was not afraid, even after the much-criticized discourse in Regensburg, to discuss the violence of radical Islamists. As interlocutors in the ecumenical movement, Pope Benedict XVI carefully chose Churches like the Orthodox and the Anglican, establishing good contacts with both while still inviting conservative Anglican dissidents to join the Catholic Church. The culmination of the friendship between Catholic and Orthodox was the encounter with the ecumenical patriarch of Constantinople. Benedict XVI also went to Great Britain, meeting with both Queen Elizabeth and the archbishop of Canterbury, Rowan Williams, and beatifying Cardinal John Henry Newman in Glasgow. It was not possible to organize a trip to Russia, yet Benedict also had good relations with the patriarch of Moscow, Cyril I, since he was metropolitan of Smolensk and Kaliningrad. 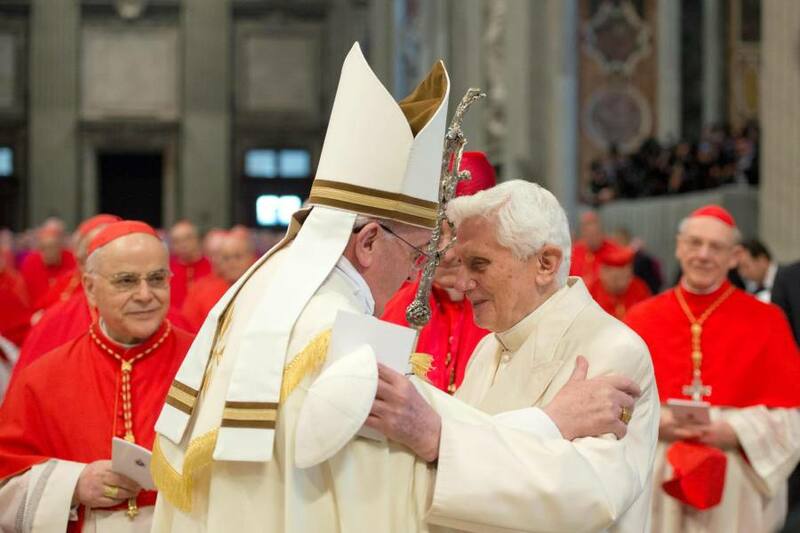 Although at the time of the council Ratzinger had worked for a positive evaluation of Protestantism, Pope Benedict XVI kept his distance from the “ecclesial communities” of the Reformation. The progressives inside and outside of the Catholic Church did not recognize the pope’s ability to act autonomously apart from the spirit of the time. To these groups a pontiff who had as his motto “cooperatores veritatis” appeared as an arrogant, unbearable prince of the Church. They did all they could to promote a negative image of the pope and rejoiced over his unexpected resignation. Among the means used, an important role was given to anti-Germanism. The method of stigmatizing Ratzinger as German, even though he rarely emphasized his Germanic identity, resembles that used by anti-Semitism when even Jewish converts are still accused of remaining Jews. In Germany, his birthplace, Pope Benedict XVI has always been a topic of debate. On the one hand his election was a sort of stroke of liberation. The fact that a German had been elected pope and therefore, so to speak, the supreme spiritual authority of the West, was in itself sensational. English tabloids like “The Sun” could not pass up the chance to compose mocking headlines (“From Hitler Youth to… Papa Ratzi”). Benedict reacted to all of this by emphasizing his Bavarian rather than German patriotism and on May 28, 2006 he went to visit the former concentration camp of Auschwitz-Birkenau. At the same time, however, he also highlighted the importance of Germany. The progressives left no stone unturned in accentuating the problems of sexual abuse and of the Fraternity of Saint Pius X, in order to undermine the authority of the pope. Conservative German Catholics, for example those gathered in the initiative “Deutschland pro Papa” or in the “Forum Deutscher Katholiken” found themselves disarmed in the face of the markedly anticlerical climate that prevailed in German public opinion. Although Benedict XVI did not expressly intend to do so, in fact he brought the dominion of modern values into question. In the context of his criticism of Marxism he supported Western parliamentary democracy, but his siding in favor of democracy was by no means unconditional. He decisively refused to introduce it into the Church, which is ordered in a hierarchical way. He also looked with skepticism at public opinion polling. His distance from the popular will is not explained only by his experience with the student movement in the 1960’s, but was already rooted in his distancing himself from National Socialism, which in its time was accompanied by thunderous applause from the majority of the population. He also did not share the optimistic evaluation of modern-day man and the progress of society. His attitude followed in the footsteps of Christian social conservatism. The appreciation of the family and of heterosexual marriage was in contradiction with the present-day multiplication of family models. The emphasis placed on the role of Christianity as the pre-political basis of liberal democracy was aimed against secularism. Benedict XVI disapproved of the criticism of Eurocentrism and reiterated the Christian character of Europe. Not only in political questions, but also and above all in cultural ones he took positions and acted as an active champion of old European culture against the tides of globalization. Pope Benedict XVI was a nonconformist on the throne of Peter. When from the seat of gold he imparted the blessing in Latin, excommunicated dissidents, held the universal Church together and affirmed the unicity of the Catholic faith, he was in fact showing his authoritative side. It comes as no surprise that his detractors, like Leonardo Boff or Johann Baptist Metz, should have criticized him. Nonetheless, the question can also be seen in a different way if it is placed within the situation in which the Church finds itself. If one looks at the dominant position of modern values, the Catholic Church is an oppressed minority while its critics belong to the majority. Thus Ratzinger’s authoritative attitude was a reaction to the prevailing situation. In any case, the combative spirit was only one side of Joseph Ratrzinger. Although he armored himself, in a certain sense, against his opponents, he never lost the willingness for dialogue. Even his most ardent critic, Hans Küng, was given a friendly reception at Castel Gandolfo. In his encyclicals, Pope Benedict XVI repeatedly dealt with themes like “love” and “hope.” Substantially he remained a Bavarian patriot, with enthusiasm always in his heart for the procession of Corpus Domini. In this sense he resembles the prince of ancient China Ling Wang (Gao Changgong). Even though he fought on the battlefield wearing a mask of the devil, the features of the face that this concealed were delicate. Questa voce è stata pubblicata il 20/08/2015 da MJ in Church and religion, ENGLISH con tag Benedict XVI, Catholic Church, Christianity, Global encounter, Hajime Konno, Japan, Joseph Ratzinger, Logos, Modernity, Ratzinger.